I have to write this post.... I simply have to. As a Christian, I cannot in all good conscience just sit back and remain silent as one man threatens to plunge the entire world into chaos... branding his warped world view and sense of reality upon us - most especially other Christians. All this for the sake of ego and arguably... the profits associated with a lucrative book deal. 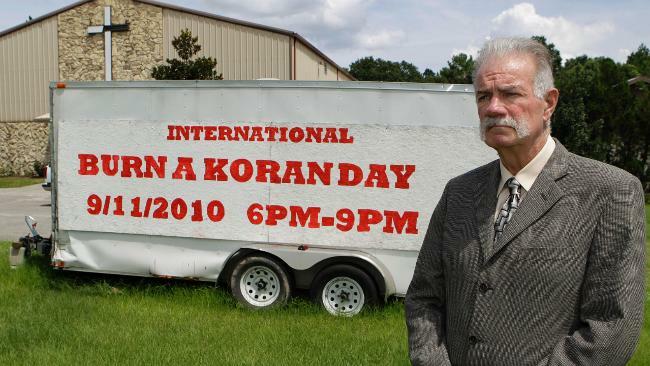 You may be forgiven for thinking I am ranting about Tony Blair again... on this occasion I have turned my gaze upon "Pastor" Terry Jones. I cannot convey in enough words how much I am repulsed by and disagree with this man and how abhorrent I find his intended course of action. The idea of publicly burning the Koran needlessly invites hostility, distrust, and mutual pain. There is nothing... NOTHING in the teachings of Christ, or the fruit of the Holy Spirit that comes anywhere near endorsing Jones' gimmicky ploy. I don't want to be associated with it by virtue of sharing the same faith. I find such a view to be irreconcilable with the character of God... and the very thought of pursuing such a course of action should in my opinion be recognised as a path of... or at least a path to... apostasy. It is not enough for me to remain silent on the topic at hand. Yes I am aware that speaking out and moving Jones into the spotlight gives him exactly the platform he craves... but if I stand by and let this man proclaim that the message of Christianity is one of hatred and fear... then by my conspiracy of silence... I passively deny Christ. Hearing that Jesus had silenced the Sadducees, the Pharisees got together. One of them, an expert in the law, tested him with this question: "Teacher, which is the greatest commandment in the Law?" Jesus replied: " 'Love the Lord your God with all your heart and with all your soul and with all your mind. 'This is the first and greatest commandment. And the second is like it: 'Love your neighbour as yourself.' All the Law and the Prophets hang on these two commandments." You might ask... is a Muslim really my neighbour? However Jesus doesn't let you get off that one easily at all, I don't believe he even gives you an option. In the Parable of the Good Samaritan, Jesus uses the most apostate person to illustrate the compassion and mercy that is displayed in true neighbourliness. Furthermore, he went on to state that we should be treating our enemies with love as well. In fact, the epistle of James criticises the bi-polar attitude with which we use our tongue... praising God in heaven.... but cursing men who are made in his very image. If we try to express love for our heavenly Father whilst simultaneously bearing malice to our fellow humans we are hypocritical and we are false. "Do not mistreat an alien or oppress him, for you were aliens in Egypt." Obviously we are not talking about little green men here... the Law here is referring to foreign influences in our society. Those of us who are Christians need to pay special attention to that. We should know exactly what it feels like to be aliens because if we are walking by faith and are no longer conforming to the pattern of the World, we are aliens and foreigners. The early Church was utilising similarities in the cultures it encountered as an introduction to the Gospel message. The chief example is of this is the experience of Paul in Athens. You can find the account in Acts 17. Paul found the common ground and used it as a hook for explaining the Gospel. He was not aggressive, his motivation came from love, not fear. I have more to say on the topic of Christianity in the face of other cultures... but I want to save that for another post. I want to move on now and look at the "freedom of speech" angle. I agree completely with the idea that we should have the freedom to speak out and say what we wish... especially when it is something that has been placed on our heart. However, all freedom comes with the attached price tag of responsibility. For Adam and Eve, freedom came with the responsibility of not eating one tree's fruit (that worked out well... didn't it); for Christians today, our freedom from sin and death comes with the responsibility of living our lives in a manner that is pleasing to God. Similarly I would argue that the responsibility attached to our freedom of speech, is choosing our words and actions wisely, understanding that there are consequences attached to those same words and actions... and accepting those consequences should they come to pass. 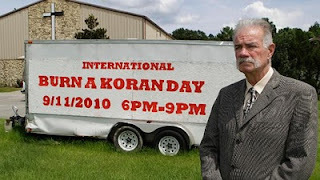 There would have been an awfully steep price tag had Pastor Jones pressed forward with his burning of the Koran... and the worst part of it is, it would not necessarily have been anyone close to him who ultimately paid that price. To act in the light of this would have been selfish, callous, reckless and utterly irresponsible. I know many Americans see the burning of flags as sacrilegious, I don't know if that's particularly an American mindset or not... but I for one as a Briton find the idea of book burning (even books you don't like or agree with), far more disturbing and reprehensible. A flag at it's best, even when it represents the ideals and standards of a nation... is just a glorified piece of cloth. Books on the other hand represent thought, imagination, and the propagation of the like; they reflect the importance of human learning. Travel through time to a distant post apocalyptic world... and waving a flag of a long forgotten nation will yield you precious little... if anything at all. Conversely, a book gives you the tools to help rebuild a broken civilisation. 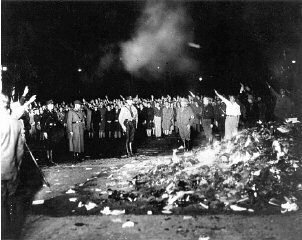 I find it highly disturbing that there are Americans out there who will sanction a book burning of any kind... especially when we have not even passed out of the living memory of the last "book burning society", and we all know where that led to. enthralled by a similar fanaticism to that of the Nazis? So what are we saying? Is it okay to burn books simply because we aren't the Nazis and we could never be like that? That's a foolish notion if ever I heard one. Prejudice isn't picky who it gets into bed with... it would be arrogant beyond belief to assume that because our ideals and those we view as "enemies" are different, we are somehow morally superior and immune to the pull of evil. The road to the Abyss is not often taken in giant athletic strides... it is more frequently stumbled into with a slow, plodding sleepwalk of ignorance. If you are not careful... when you awaken, you may wonder where all your old ethnic friends have gone... oblivious to the part your lack of vigilance played in their disappearance. I want to finish this little tirade with one thought, one positive conclusion. In all things, we should flee from fear and embrace love... for this is what God called us to. The Bible teaches us that if we are dominated and motivated by fear, we are not complete in love... for God's perfect love drives out fear. Fear will try and seduce us with many things... and even justify them... but if we can only look beyond that and treat one another with love (even when it seems to be to our detriment), let love be our one, sole motivating factor... we would be living lives that thoroughly please God.... and bring light to a world in darkness that hungers so desperately after it. Even when it fails to see it... especially when it fails to see it.